Brad Kahlefeldt, Gold Coast resident and the Melbourne Commonwealth Games triathlon gold medalist, gave his public support to the Save Our Spit campaign during 2006. (refer article Athletes Fight to save their Training Ground) Brad spoke about living and training on the Gold Coast and highlighted what an asset The Spit is for elite athletes, in particular for training in the running and cycling disciplines of the triathlon. During our conversation with Brad he pointed out that several European triathlon teams base themselves on the Gold Coast during summer before the World Cup season begins. These teams bring their entourage of coaches, masseurs and mechanics renting apartments and contributing greatly to the local economy for several months a year. 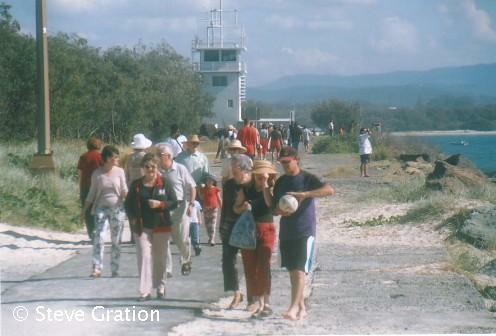 They are attracted by the world class training conditions on the Gold Coast, including the highly regarded Spit. SOSA supporters and members will be delighted to learn that since expressing his support for our Save Our Spit campaign Brad has produced some remarkable Triathlon results including wins in World Cup events in Hungary, UK and South Africa during 2006. Early in 2007, Brad has already won the Luke Harrop Memorial Triathlon on the Gold Coast, the Australian/Oceanic Championship in Geelong and the First ITU World Cup event of the 2007 season at Mooloolaba, Qld. Nicknamed 'Sticksy' (something to do with his legs) Brad is a former Under 23 World Champion. His courage in publicly supporting the Gold Coast community throughout the Save Our Spit campaign is matched by his courage in becoming the Number One rated triathlete in the World this year. We wish Brad all the best for the remainder of the 2007 World Cup season and in his aspirations to represent Australia at the 2008 Beijing Olympics.